A series where Failed Critics contributors look back on a particular decade in the world of cinema and choose their favourite films from each year of that decade. Matt Lambourne has lucked out with arguably the most entertaining, balls-to-the-wall decade of all. This week he takes us through his choices for 1981. Every so often, a movie comes to the fore that is so inherently bad, that it ends up being brilliant. There are a few that I particularly enjoy as guilty pleasures, such as Streetfighter and perhaps more recently Iron Sky. However the original film from my childhood that falls into this category is ‘Condorman’. The plot surrounds comic book writer, Woody (Michael Crawford), who insists that all his creations must be able to perform their talents in real-life before he commits them to paper. 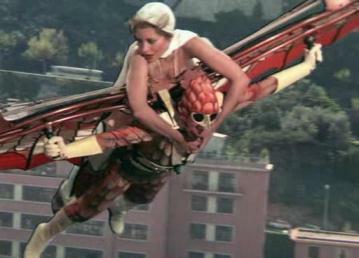 However he is struggling to legitimise his latest creation, a flying crime-fighter called Condorman – as depicted in the opening scene where he fails to fly with mechanical wings from the top of the Eiffel Tower. Hilarity prevails as Woody bumbles his way into the affairs of the CIA & KGB as he pushes the real-life boundaries of his Condorman creation too far, posing as the former’s newest top agent. The action is awkward, yet stupidly funny, imagine Jason Bourne played by Basil Fawlty and you have a good idea of where this ends up. The movie is anything but cold-war espionage coolness personified; after all it is a Disney movie. However the cast somewhat legitimises the erratic nature of the subject matter with the late Oliver Reed playing the leading bad-guy as Krokov the KGB operative and the lovely Barbara Carrera (Never Say Never Again) as the film’s love interest. It also adds some entertaining action set-pieces and a very cool car-pursuit scene featuring a fleet of souped-up Porsche 911’s that even the Fast & The Furious would be envious. Condorman’s own vehicle would impress even Bruce Wayne! It goes without saying that this film gets nowhere near the IMDB top 250, it even has a 25% approval rating on Rotten Tomatoes. However it does hold a cult status amongst fans that keeps interest in the franchise alive and an updated version beckons as part of Disney’s new vision for the future. I personally, cannot wait! Painted in the doldrums of a decaying future, revolutionists have hijacked Air Force One and crashed landed the jet into Manhattan Island. The island is now an impregnable fortress used to house all of America’s most dangerous criminals. The US authorities, unable to send in a mass force for fear of endangering the captive president’s life can only rely on one man.. Snake Plissken. The role of Snake goes to Kurt Russell, who really shakes off his image as a pretty faced child actor as the down and dirty, super cool and unflappable ex-Special Forces operative. This movie is also a continuation of a mini love-affair between actor and the film’s director John Carpenter, the likes of which weren’t again seen until Tim Burton got his hands on Johnny Depp! Escape from New York is all atmosphere. The film is shot entirely during the night time and danger lurks around every corner of the rotten Metropolis. It very much reminds me of the nihilist future as depicted in 1979’s ‘The Warriors’ and continued later this decade in ‘The Running Man’. The action is far from snappy, it’s somewhat clumsy and lacks finesse. But the slick nature of the characters, such as Isaac Hayes as the Prison Boss ‘The Duke’ allows you to really take in a rough 90min action ride. Other notable performances come in the form of Western star Lee Van Cleef as the slimy police boss ‘Hauk’ and Adrienne Barbeau as the most distracting on screen cleavage for the whole year! It’s not hard to see why John Carpenter put a ring on it. The Snake Plissken role sets a good model for movie anti-heroes, smooth lines, tough and fearless but ultimately doing bad things for good causes. The soundtrack adds to the dystopia portrayed nicely and encapsulates the period of time well. The franchise spawned 2 sequels much further down the line, both with much bigger budgets, however Escape from New York delivers an unintended grittiness that can only be enforced by a lack of funds and ultimately delivers a much darker tone to the movie. Thoroughly British in it’s almost slapstick delivery, ‘An American Werewolf in London’ has everything, from awkward and uneasy comedy to brutal gore-scenes for hardened fans of the genre. 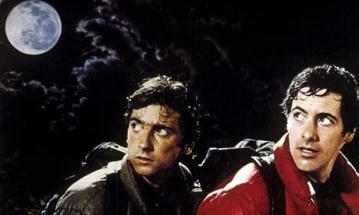 The film follows David (David Naughton), an American tourist who survives a Wolf attack that kills his best friend. Oddly some of the films most curious moments come from scenes were his dead friend re-visits him as a Zombie to warn him of his impending transformation into a Werewolf and that the bloodline must end for his victims to rest in peace. Naturally, David does not take heed of the warnings, unsure of if his friend’s visits are a figment of his imagination or indeed the truth. Eventually the beast is unleashed upon London town and makes for a wonderfully cold trail of death that is uncompromising in its lack of fan-fare. The whole movie is shot on location in the UK and I most admit that I find that the UK movie industry just does these movies far better than our Hollywood counter-parts, see ‘28 Days Later’ as an example. There is something far more sinister about the Middlesex moors and the cold, wet alleys of London than the steamy neon nightlife of New York for example. No, AWIL does not over-complicate, it removes any unnecessary dramatics and creates frightening scenes of bloodlust, yet somehow you still feel charmed by our leading man. In a decade dominated by American Horror, this film collected an Oscar for it’s gruesome use of make-up and shows one of the most painful looking transformation scenes that I can recall. It’s very much a genre-defining classic and a must see for all horror fans. It goes without saying that Raiders could easily have been my #1 pick for 1981. Harrison Ford became probably the biggest Box Office star over a 5-year period in which everything LucasArts and Steven Spielberg churned out turned to absolute gold. 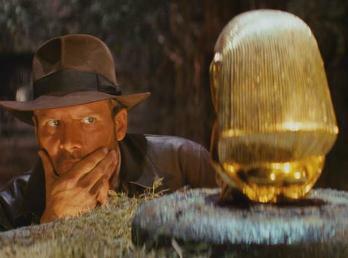 Ford plays the whip-wielding Indiana Jones, archeological & occult expert who is sent on a mission to recover the lost Ark of the Covenant before it falls into the hands of Nazi Germany. I should not need to go into itty-bitty details about the plot; we’ve all seen at least one Indiana Jones movie. Partly this misses out on #1 movie for 1981 mostly because it’s not actually my favourite film from the original trilogy. Alas, however Raiders is a magnificent piece of action-adventure cinema. Shot in many luscious and beautifully exotic locations, it’s oh so easy on the eye. Ford brings charisma to the Indiana Jones character in equal measure as he did Han Solo, perhaps even more so. The film is renowned for some of its action set pieces, such as the rolling bolder booby trap during the opening sequence and the hilarious standoff between Indy and the Sword wielding Egyptian soldier. It’s a great story of exciting action, peril in abundance and a story of good vs. evil, as the Nazis are ever willing to take up the bad guy role. The now famous John Williams assortment is the final piece of the jigsaw although he sadly lost out to Vangelis’ score for Chariots of Fire in the Oscar prizes. The movie however did collect 4 Oscars and cemented the credentials of Spielberg and Lucas, setting up a golden area for the two during the early 80’s, as well as spearheading Harrison Ford for a career beyond StarWars. Raiders takes its place high amongst its peers on the IMDB top 100 as one of the most memorable and fun movies of the decade. It goes without saying that ‘Das Boot’ is one of the toughest watches of any film I’ve ever happily enjoyed watching. For starters, I am reviewing the extended version of an already epically long movie, weighing in at over 3 hours which for any film is a tough ask! However being a sub-titled movie it requires a certain dedication that adds to the viewing experience as you are slowly sucked into the despair felt throughout the movie. The movie follows a German U-Boat crew who depart on a mission to intercept Allied convoys across an already faltering and mis-directed Axis line of blockades in the Mid-Atlantic. As the film begins we find the fledgling crew celebrating in a debauched leaving party, seemingly unaware of the miserable existence that awaits them under the Ocean’s surface. However, Ship Captain Lehmann-Willenbrock (Jürgen Prochnow) is starkly aware of the dangers that await his inexperienced crew. The movie quickly plunges from indulgence to desperation as our crew is continually faced with overwhelming odds against the Royal Navy and mis-direction from their superiors. Gradually the viewer is proverbially grabbed by the throat and dragged into a nerve-wracking journey of strained human relationships and the mental breakdown of a threat that you can often only hear, but rarely see. Prochnow is superb as the battle-weary Captain and director Wolfgang Petersen makes so much from so little real-estate in the claustrophobic metal tube. This would be regarded as Petersen’s 1st great work and perhaps his best ever before eventually working on more mainstream titles such as The Neverending Story, Troy and The Perfect Storm. However it really is ‘Das Boot’ that delivers his most heavyweight punch and sets the benchmark high for other great Submarine movies that followed, such as Hunt For Red October and K-19: The Widowmaker. The movie ends on the most sombre of moments. After suffering heavy damage and effectively been sunk, the crew manage to revive the crippled boat and reach sanctum at La Spezia port, only to be attacked and destroyed by an Allied Air-Raid as they leave the ship. The credits roll as the Captain lives just long enough to watch his boat sink at port and keel over and die with the rest of his crew. Like any good war movie, Das Boot reminds you at all times during war just when you think there is light at the end of the tunnel, all hope is brutally snatched away. 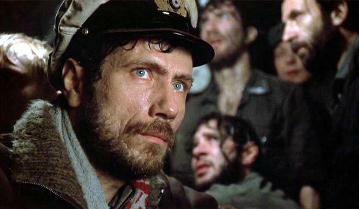 Das Boot is not just a great Submarine movie, it’s a fantastic movie in it’s own right which rightfully takes it’s place amongst the IMDB Top 100 and is my movie of 1981. See the five films Matt picked for 1980 or check out the full A Decade in Film series so far.